NOTE: This post was updated 29 November 2016 to reflect the change in our Replay software. The webinar recording from 11 December 2015 is still available below. Please also watch the webinar from October 2016 on editing captures with the new platform. NOTE: We no longer support Echo360 Personal Capture. Instead, please use the Replay Panopto ‘At-Desk’ Recorder. Flipped classroom approaches involve the delivery of core module content in advance of a face-to-face taught session. In many cases, this would involve recording lectures to be delivered online and watched by students before the workshop, seminar or follow-up lecture. In this webinar we provided an overview of the Replay at-desk recording software and advice for improving the quality of your flipped lecture recordings. The tips linked below are still valid with the new Replay software. As usual with the ELDT webinars, the first part was a presentation with the second part open to questions and working through any problems you might have. Colleagues are welcome to download the software and test out making captures within a private space we’ll set up for you (see Replay ‘At-Desk’ Guide). You can request additional Replay Folders (spaces to upload videos into) for your modules: Replay Folder Request Form. Two key considerations in the development of the flipped learning approach is to make your online space structured and to encourage students’ active learning. As a basic example, the screenshot below shows one week’s worth of content and activity for a fictional module. As explored in the previous webinar, consistency of the structure is important on a week-by-week basis to enable students to get into the rhythm of keeping up with the module content. Click the screenshot to view a larger image. Aim of the week, including its relationship with the module, outlined at the top of the page. This grounds the content within the module and allows the student to link to prior learning. Learning outcomes, enabling students to judge their own understanding against these outcomes as a result of completing the activity. Clear expectations about what will need to be completed by when, how it links to the face-to-face session,preventing students falling behind. Task details, clear step-by-step task specification. Resources, such as online lectures, readings, websites, all explicitly referenced from the task details so that students have a clear understanding of their purpose and what they are expected to take away from the resource. 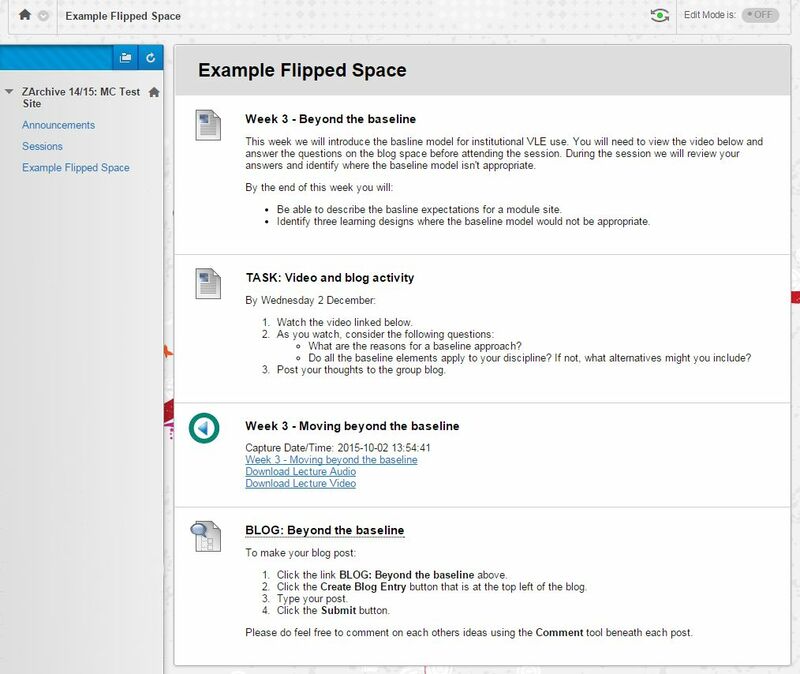 Activity space, in this example a blog tool is used to provide space for students to answer questions based on the resources. This encourages the students to be active in their use of the resources, rather than passively assuming something will ‘stick’. Asking students to provide a response also provides lecturers something to draw upon in the face-to-face session, either as a discussion starter or if a quiz is used, to focus attention on points not fully understood. Whilst moving lecture content online allows flexibility in terms of how and when students engage with the content, you must also ensure that the content is accessible to disabled students (Equality Act 2010). If you present a number of visual images that convey information, you will need to either describe these in your narration or in a plain text format so that screen-reader (text-to-speech) software can be used. For audio content (for example an mp3 podcast or a video), you will need to provide captions, a transcript, or another suitable equivalent that provides all the learning points that are conveyed through the multimedia resource. Quite often, you will find the preparatory materials you use to create online lectures, such as crib-sheets or scripts, can be quickly adapted as the accessible alternative for students. You can contact the E-Learning Development Team for further advice on the creation of learning resources and the pedagogical approaches appropriate to a flipped learning approach. See also the resources linked to the previous webinar.